An'ei era: nephew of Matsumoto Kôshirô IV, he became a disciple of Sakurada Jisuke I. His pen name was Muraoka Kôji. 11th lunar month of 1780: Kôji worked as a sanmaime sakusha at the Ichimuraza, along with his master Sakurada Jisuke I and Kasanui Sensuke I, on the kaomise drama "Mure Takamatsu Yuki no Shirahata". 11th lunar month of 1782: Kôji worked at the Ichimuraza, along with Kasanui Sensuke I (tatesakusha) and Sei Basetsu, on the kaomise drama "Ise Heiji Eika Goyomi". 11th lunar month of 1783: Kôji worked at the Moritaza, along with Katsu Hyôzô I and Sei Basetsu, on the kaomise drama "Ono no Terusaki Yuki no Akebono", which celebrated the shûmei of Sakata Hangorô III. 11th lunar month of 1785: Kôji worked at the Nakamuraza, along with Masuyama Kinpachi I, Nakamura Jûsuke II and Takarada Jurai, on the kaomise drama "Yuki Motsu Take Furisode Genji". 11th lunar month of 1786: Kôji worked at the Nakamuraza, along with Kanai Sanshô and Katsu Hyôzô I, Kanai Sanshô and Nakamura Jûsuke II, on the kaomise drama "Kumoi no Hana Yoshino no Wakamusha", which welcomed in Edo the Kamigata actor Arashi Murajirô and starred Sawamura Sôjûrô III, Ichikawa Yaozô III, Ôtani Hiroji III, Onoe Matsusuke I, Osagawa Tsuneyo II, Sanogawa Ichimatsu III, Nakajima Kanzaemon III and Bandô Matatarô IV. 1st lunar month of 1787: Kôji worked in the same theater on the new year sogamono "Ôichô Kongen Soga"; the roles of Kudô Saemon Suketsune, Soga Jûrô Sukenari and Soga Gorô Tokimune were played by Onoe Matsusuke I, Sawamura Sôjûrô III and Ichikawa Yaozô III. 11th lunar month of 1787: Kôji worked at the Moritaza, along with Kanai Sanshô, Katsu Hyôzô I and Nakamura Jûsuke II, on the kaomise drama "Tsuranaru Edamure Takamatsu", which celebrated the shûmei of Iwai Kiyotarô II, Sawamura Kameemon and Sawamura Harugorô II. 11th lunar month of 1788: Kôji worked at the Nakamuraza, along with his master Sakurada Jisuke I, Shimizu Shôshichi I, Kimura Enji I, Tamamaki Kyûji and Kawatake Bunji, on the kaomise drama "Tôzumô Hana no Edokata", which celebrated the return in Edo of the actor Nakamura Nakazô I. 11th lunar month of 1789: Kôji worked at the Nakamuraza, along with his master Sakurada Jisuke I, Segawa Jokô I, Shimizu Shôshichi I, Tamamaki Kyûji and Kimura Enji I, on the kaomise drama "Komachi-mura Shibai no Shôgatsu"; "It is a spectacular play on a grand scale, showing a struggle between two imperial princes for the imperial throne and the almost magical powers of the great poet Ono no Komachi, also considered one of the greatest beauties of her time. In ancient times, Komachi was such a famous figure that she became the subject of many Nô plays, one in which her poetry called forth rain and another in which a jealous rival tried to defeat her by claiming that a poem she wrote was actually plagiarized from an old poetic anthology. She proved her innocence by washing the book of the anthology and showing that the fresh ink of the supposedly old poem easily washed away." (source: Earphone Guide website for the revival in January 2008 at the National Theatre). 1st lunar month of 1790: Kôji worked in the same theater on the new year sogamono drama "Haru no Nishiki Datezome Soga"; the roles of Kudô Saemon Suketsune, Soga Gorô Tokimune and Soga Jûrô Sukenari were played by Ichikawa Monnosuke II, Ichikawa Omezô I and Ichikawa Komazô III. 11th lunar month of 1790: Kôji worked at the Nakamuraza, along with Sakurada Jisuke I (tatesakusha), Masuyama Kinpachi I, Kimura Enji I and Shimizu Shôshichi I, on the kaomise drama "Sayo no Nakayama Hiiki no Tsurigane", which welcomed back in Edo the actor Ichikawa Yaozô III and welcomed the Kamigata actors Tanimura Torazô and Nakamura Kumetarô II. 11th lunar month of 1791: Kôji worked at the Nakamuraza, along with Sakurada Jisuke I (tatesakusha), Tamamaki Keisuke and Shimizu Shôshichi I, on the kaomise drama "Sayo no Nakayama Hiiki no Tsurigane". 11th lunar month of 1794: Kôji worked at the Kawarasakiza, along with Nakamura Jûsuke II and Shimizu Shôshichi I, on the kaomise drama "Matsu no Misao Onna Kusunoki". 11th lunar month of 1795: Kôji became tatesakusha and worked at the Kawarasakiza, along with Kimura Enji I, on the kaomise drama "Fuku Botan Azuma Dairi". 11th lunar month of 1796: Kôji worked at the Kawarasakiza, along with Sakurada Jisuke I (tatesakusha) and Fukumori Kyûsuke I, on the kaomise drama "Itsukushima Yuki no Sugata Mise". 11th lunar month of 1798: Kôji worked at the Nakamuraza, along with Fukumori Kyûsuke I, on the kaomise drama "Hana no Mimasu Yoshino no Fukayuki". 11th lunar month of 1799: Kôji worked as a tatesakusha at the Moritaza, along with Kawatake Bunji and Hon'ya Sôshichi , on the kaomise drama "Happyakuchô Hisago no Kanzashi". 11th lunar month of 1800: Kôji worked at the Ichimuraza, along with Nagawa Shimesuke I (tatesakusha) and Chikamatsu Monkyô, on the kaomise drama "Oishigeru Nami no Une Une", which celebrated the shûmei of Ichikawa Danjûrô VII and Arashi Kanjûrô I. 11th lunar month of 1801: Kôji worked at the Kawarasakiza, along with Sakurada Jisuke I (tatesakusha), Shimizu Shôshichi I, Tajima Konosuke I, Matsushima Hanji I and Hon'ya Sôshichi , on the kaomise drama "Meika no Toku Mimasu no Tamagaki", which celebrated the shûmei of Bandô Yasosuke I and Morita Kan'ya IX. 11th lunar month of 1802: Kôji worked at the Nakamuraza to assist his master Sakurada Jisuke I on the kaomise drama "Koshiji no Hana Oedo no Torideki". 11th lunar month of 1804: Kôji worked at the Ichimuraza, along with Namiki Gohei I, Matsui Kôzô I and Shimizu Shôshichi I, on the kaomise drama "Mishi Tamadare Yuki no Furusato", which celebrated the shûmei of Suketakaya Takasuke II, Ichikawa Takinosuke and Kiriyama Monji III. 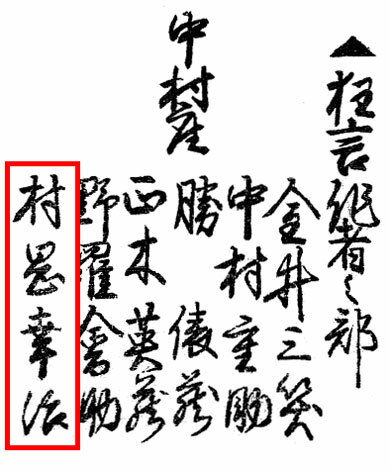 11th lunar month of 1805: Kôji worked at the Ichimuraza, along with Namiki Gohei I, Matsui Kôzô I, Shimizu Shôshichi I and Shinoda Kinji I, on the kaomise drama "Keisei Yoshino no Kane". 11th lunar month of 1806: Kôji worked at the Ichimuraza, along with Namiki Gohei I, Katsu Hyôzô I, Matsui Kôzô I, Shimizu Shôshichi I and Shinoda Kinji I , on the drama "Wakazakari Heike Monogatari". 11th lunar month of 1807: Kôji worked at the Ichimuraza, along with Katsu Hyôzô I, Fukumori Kyûsuke I, Shimizu Shôshichi I and Matsui Kôzô I, on the kaomise drama "Kigoto no Hana Yashima Kaijin". 1st lunar month of 1808: Kôji worked in the same theater on the new year sogamono drama "Tsuki no Ume Yawaragi Soga"; the roles of Kudô Saemon Suketsune, Soga Gorô Tokimune and Soga Jûrô Sukenari were played by Bandô Mitsugorô III, Onoe Eizaburô I and Sawamura Gennosuke I. 6th lunar month of 1808: Kôji worked in the same theater on Katsu Hyôzô I's spectacular natsu kyôgen (and tenjiku-tokubeimono) drama "Eiri Otogi Zôshi". No record afterwards. Muraoka Kôji I was an important Edo sakusha, who was active from the beginning of the 1780s to the second half of the 1800s. He worked for the actors Matsumoto Kôshirô IV and Ichikawa Yaozô III. Others minor sakusha were Kimura Matsuroku, Sasa Rindôsuke, Hyakusen Manbê and Mura Gohachi. Others minor sakusha were Utei Senji, Oka Tanji, Fujikura Sanji, Muraoka Gohachi and Motofune Tosuke.